More than half of Americans are missing at least one tooth, and 35 million are completely edentulous – without any teeth at all. These numbers are expected to grow. Currently 90 percent of those who have lost all their teeth have dentures, but in recent years more and more patients are choosing dental implants as the method of replacing their teeth. Modern dental implants have been in use since the 1950s when Per-Ingvar Brånemark discovered that titanium, when inserted into the body, routinely fused with existing bone. This process, called osseointegration, became the foundation for modern implant dentistry. Dental implants, after being inserted into the jawbone, can hold replacements for single teeth as well as a complete set of teeth. They also stimulate the bone as natural tooth roots do to prevent decay of the remaining jawbone. Generally 4-8 implants are necessary to hold a full set of teeth in each jaw. The number of implants may depend on the health and bone density of the jaw into which the implants will be placed. If there isn’t enough bone, a bone graft may be required. But as technology advances, so have techniques to make getting a full restoration a little easier for patients. 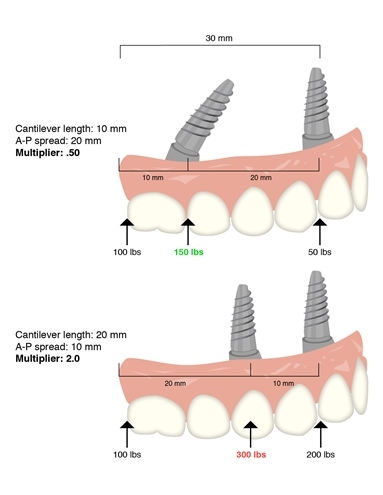 Since the mid-1990s, the All-on-Four technique has given patients an efficient dental implant option that provides a success rate equal to older styled conventional implant treatments. Compared to conventional implants, the All-on-4 implant procedure can provide a less invasive solution with faster recovery time for many patients looking for a replacement of a full set of teeth. For eligible candidates, Dr. Lee Fitzgerald uses the All-on-4 system because it can be a superior solution for stability and longevity when compared to conventional dental implants. In the All-on-4 procedure, instead of being inserted perpendicularly to the gum and jaw, the implant is placed at an angle, between 17 and 30 degrees up from the prosthesis. This means eligible candidates usually will not need a bone graft since the procedure allows for a longer implant that — combined with its positioning — anchors it in higher volume and quality of bone to improve support. It works similarly to the increased support an angled nail provides to hanging a large photo when compared to a nail hammered straight into the wall. Another limitation to conventional implants is how far toward the back of the jaw they can be placed. If they are inserted too far back, they can impact and damage the sinus (when placed in the upper jaw) or the mandibular nerve (when placed in the lower jaw). In the All-on-4 procedure, however, the angle of the implants helps them avoid hitting the sinus or mandibular nerve and allows the insertion point to sit further back in the jaw than a conventional implant. This extra distance between implants helps relieve the pressure on the implants, which helps contribute to the procedure’s 98 percent success rate. It also allows for more teeth to be placed in the back of the jaw. The less invasive nature of the All-on-4 also reduces the recovery time for the patient. Normally bone grafts can take 3-6 months to heal before the implants can be placed; the All-on-4 procedure usually does not require this step and causes less trauma since it uses fewer implants. As a result, the patient may be able to have the entire set of non-removable teeth placed with little to no pain and no swelling in one day. The All-on-4 procedure offers the same success rate as traditional implants, but for the right patients, it can reduce the recovery time and allow patients to have new teeth within a shorter amount of time. Eligible candidates must have certain oral and medical health conditions to qualify for this treatment. The procedure will not be immediately available for those patients that will require bone grafting or another surgical procedure before implants can be placed. The Forte Dental Implant Center is able to conduct each step of the dental implant process onsite and minimize the number of trips patients must take. With education consultants an implant dentist, and a full-service dental laboratory, the Forte Dental Implant Center is able to take a patient from start to finish, so make your appointment with Dr. Fitzgerald to see if the All-on-Four can work for you.